What is tailgating? In terms of driving, tailgating is simply driving too close to the vehicle in front. I’m sure almost everyone has had an experience with tailgating. It doesn’t take long, even as a learner driver you’ll experience it all too often. 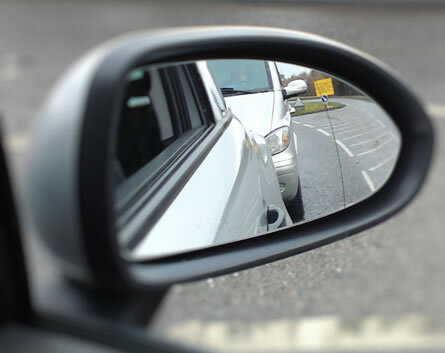 You look into your rear view mirror not to see another vehicle, but the face of the driver behind so close that it appears they’re on your back seat. Tailgating is a rather unusual driving habit as there’s apparently so little to be gained by doing it, but yet so much to lose. So why do people do it? Let’s look at why, the dangers associated with tailgating, how to deal with a tailgater and possible fines. Tailgating is incredibly dangerous as it leaves such a small margin for stopping distance; both thinking distance and braking distance combined. Unfortunately tailgating is a highly selfish form of driving ‘technique’, as the consequences that typically result in an accident, seldom involve the offending driver alone. Persistent tailgaters are effectively limiting themselves to when they will be involved in an accident, rather than if, as it’s impossible to consistently maintain the levels of concentration needed to drive in such a way. Tailgaters are limiting themselves to the necessity of concentrating on only the vehicle in front, whereas they should also be concentrating on the road up ahead. Tailgaters are also removing ‘exit routes’. One of the main reasons for the invention of anti-lock brakes is the prevention of locked wheels so that a driver in an emergency braking situation can maintain control and has the ability to steer away from an accident, to find an exit route. Tailgaters have no exit routes. Their only route is into the 1.5 tonne piece of metal in front of them. There’s various reasons. A particularly common reason for tailgating is being late. We’ve all been there before – running late, you get stressed, need to get there faster and find yourself edging ever closer on the driver in front in a bid to subconsciously push them along at a faster speed. For the better drivers common sense usually prevails and the realisation that you’re probably late because you didn’t plan your day properly and that tailgating isn’t going to get me there any faster. Other drivers with motive; delivery drivers (white van man) often have a huge workload to accomplish in a day, and again stress plays a part in a drivers habits. Taxi drivers getting to their next job as quickly as possible, all of which constitutes to the motives behind tailgating. Then there’s the bully. The driver that gains satisfaction from tormenting others. A large proportion however, are those that don’t even realise they’re doing it, and their motivation being security. It’s a little like driving in fog, you can see almost nothing in front of you, you’re nervous and stressed, and then you see a set of tail lights up ahead. You feel somewhat confident that ‘ you’re not in this alone’ and feel compelled to get a little closer so as not to lose them. These tailgaters believe they benefit by copying the vehicle in front, maintain the same road position and speed, and to keep close so to provide them with the illusion of security. Whatever the motives, it’s always going to be bad and dangerous driving. Extremely high probability of impact with vehicle ahead due to emergency braking or loss of concentration and also a lack of emergency exit routes. Tailgating can initiate or contribute to road rage. Increased fuel consumption. Tailgating significantly increases the need to brake. The brakes absorb all the kinetic energy that was produced by the engine burning fuel to propel the car. This in turn increases the need to accelerate more. Increased brake disc and pads wear. Stone chips on the bonnet, roof and front windscreen. There are no benefits associated with tailgating. Tailgating is a form of careless driving and is therefore an illegal traffic offence. Previously less serious careless driving offences such as tailgating would see a driver being summons to court by receiving a Notice of Intended Prosecution (NIP) either at the scene of the offence or by post. Police have now been granted the power to issue on-the-spot fines for less serious offences by issuing the driver with a Fixed Penalty Notice (FPN) along with penalty points. These measures have been introduced to make it easier for police to issue penalties and fines and to alleviate courts from dealing with less serious offences. However, as some motorists may be unaware of the dangers associated with tailgating, the police are able to offer educational training as an alternative to endorsements and fines. New laws allow the police to issue a FPN where the offender will receive three penalty points on their licence and a fine of £100. It can be stressful and ultimately anger inducing having to deal with a tailgater, especially if you have passengers or children in the back. After all, why should they put the lives of you and your passengers at risk? It is however important to remain calm as increasing your stress levels may contribute to a potentially dangerous incident yourself. Although tempting, avoid momentarily hitting your brakes in an attempt to scare the tailgater and teach them a lesson. The chances are, they probably don’t even realise their bad driving practices and all you’re likely to achieve is an even more increased risk of an accident. It’s always worth assessing your own driving before passing judgement however. Ensure you’re not aggravating the situation by for example, driving too slowly for the conditions. Driving too slowly can be an offence just as speeding is. It causes drivers to become impatient and frustrated, often leading to dangerous manoeuvring. 1. If it is safe, convenient and legal, pull over on the left and let them pass. Don’t forget to use your indicators and allow them plenty of time to react to what you’re doing, after all, they are tailgating you and they don’t have too much time to react. 2. If pulling over isn’t an option, increase your following distance from the vehicle in front. 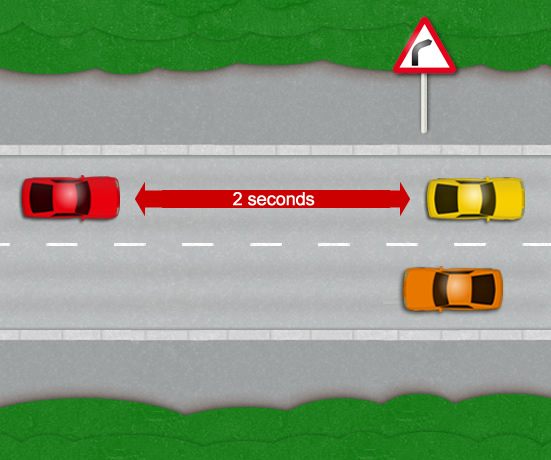 A good way to judge a safe following distance in dry conditions is the 2 second rule. Add another second to this rule and by doing so will enable you more time to react to the vehicles that you’re following. This will in turn provide the tailgater behind you with more time to react and so reducing the chances of an incident occurring.